Atlas foundations offers various products for earth retention and excavation support systems. These include the construction of bored piled walls like secant and contiguous pile walls with or without ground anchors, sheet piles, soldier piles with concrete panels or timber planks and soil nails or rock bolts. We have expertise in the installation of permanent and temporary ground anchors as well as struts for deep excavation support systems. 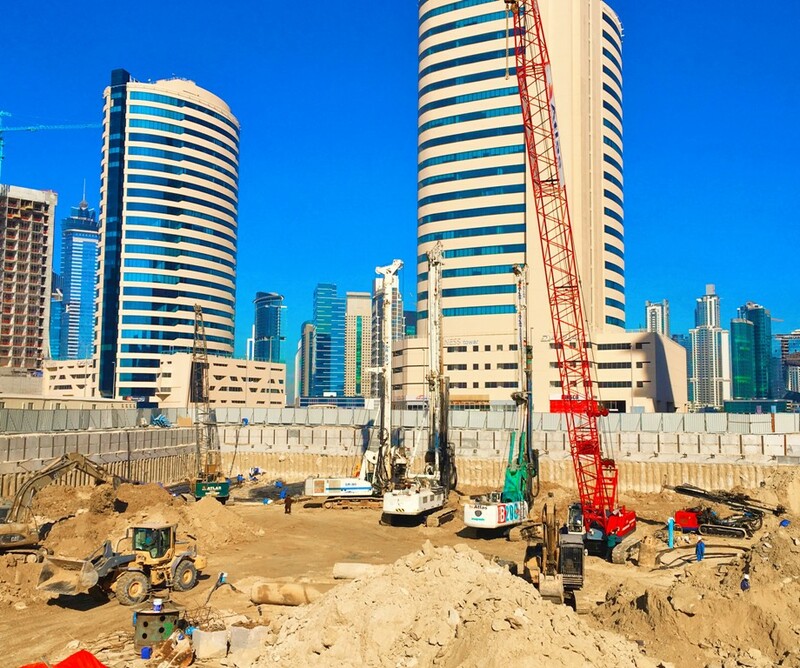 Our design team has expert engineers for the design of shoring systems. We have engineers who have vast experience in geotechnical investigation and engineering giving them an edge in the analysis of soil conditions. Parameters such as surcharge loads, soil properties,and water pressure are carefully assessed to find the optimum design for the system. The appropriate shoring system is proposed based on the soil conditions as well as neighbouring structures. Secant and contiguous pile walls involve the construction of reinforced and unreinforced piles which may or may not overlap each other to form a shoring wall. This wall can be further supported by ground anchors or internal struts. The process starts with the construction of a guide beam which sets the template for the piles. This is followed by the construction of unreinforced piles with a gap in between for the construction of reinforced pile later. The reinforced pile is drilled between two unreinforced piles thus creating an overlapping wall of piles with and without reinforcement. Secant pile wall is best suited for soil profile where water level is high or if there are surcharge loads on active sides of the shoring. Another pile wall system for shoring is contiguous piles which is a wall of reinforced piles closely spaced but not overlapping. Contiguous piles are suitable for soils where water table is not high or is lowered through proper dewatering. Both systems are further reinforced by the construction of a capping beam connecting them all through one monolithic reinforced concrete beam. Secant and contiguous pile walls also have ground anchors and struts to give them lateral support. Sheet piles are prefabricated interlocking steel sheets which are driven in the soil for support low to medium height excavation. Ideal for places where the shoring has space constraint. Anchors can also be provided with sheet piles to provide lateral support if required. Sheet piles are usually inserted by vibratory hammer. In dense or hard soils the insertion of these sheet piles can be a slow process but high frequency vibratory hammers can be useful in such soils. Sheet piles are reusable and can be extracted after the construction proceeds beyond the basement construction. 1. Provides high resistance to driving stresses due to its shape and material. 3. Sheet piles can be reused on several projects. 4. Sheet piles have long service life above or below water with modest protection. Soldier piles are I or h beams which are also driven in the soil to have concrete panels or timber planks placed between them to prevent the soil from caving inside the excavation. 1. Soldier piles take very less time to install. 2. Soldier pile system is a cheaper excavation support system as compared to other conventional methods. 3. Soldier piles can be very useful in areas where service lines are present and can be easily adjusted to repair or move the service lines. 4. Timber or concrete panel lagging can be cheap and fast. 5. Construction of soldier pile and lagging walls does not require very advanced construction techniques.